I actually used to believe this myself. I thought that healthy food didn’t taste good, but like a “good girl”, I suffered through it anyway. This is because I had a completely different idea about what healthy food was. I thought that if I was cutting as much fat and calories out of my diet as possible, I was eating healthy food. What were these foods that I thought of as healthy? Fat free mayonnaise, fat free cottage cheese, dry chicken, and for a real treat – baked pieces of cardboard (otherwise known as “fat-free chips”) with low-cal salsa. With all due respect to fat-free anything – yuck. Just…yuck. Unless, of course, it is naturally fat free. Apples don’t have fat and they still taste good. But that’s because God made them that way. Real food always tastes better when you eat it the way God made it. (Don’t get me started.) 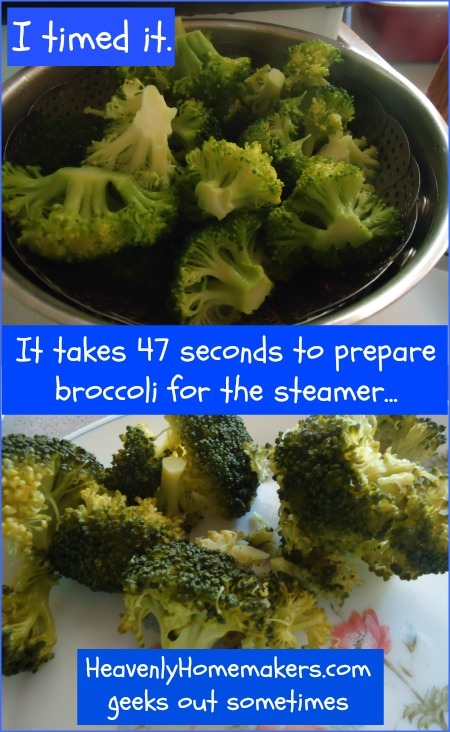 But as soon as you start pulling the real stuff (fat, nutrients, etc.) out of a food and replacing it with chemicals to make it “healthy”, the taste of that food is forever altered and well…yuck. 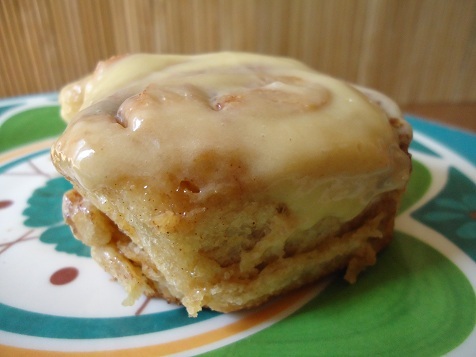 Serve these Whole Wheat Cinnamon Rolls, and I bet no one would complain about eating healthier food. Compare a chewy chicken nugget from a box, to a juicy beef roast with gravy, roasted potatoes, and carrots – and tell me healthy food doesn’t taste good. Pull some hearty, homemade honey whole wheat bread out of the oven and slather it with (real!) butter – and tell me healthy food doesn’t taste good. Whip some cream and plop some on top of fresh strawberries – and tell me healthy food doesn’t taste good. Grill a steak, serve it with tossed green salad, and corn on the cob – and tell me healthy food doesn’t taste good. Scramble some farm fresh eggs with some chopped tomatoes, peppers, and grated cheddar cheese – and tell me healthy food doesn’t taste good. You can open your eyes now. ;) I think I’m finished thinking of amazing, healthy food that tastes good, but I’m hungry right now, so no guarantees. My point is – real food is healthy, and real food tastes incredibly good. In addition, it is satisfying, and makes your body feel good, since your body recognizes what you are feeding it when you are feeding it real food. It is delicious food and you feel great as a result. It’s a win-win situation. Rich chicken broth with veggies and homemade noodles; fresh whole wheat biscuits right out of the oven dripping with honey; a peach right off the tree; garden fresh vegetables dipped in homemade ranch dip; whole grain pancakes with melted butter and real maple syrup…. What are your favorite real foods? 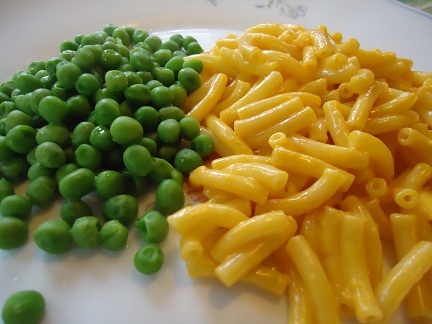 Homemade Mac and Cheese vs. Annie’s Mac and Cheese – Which Takes More Time? The Macaroni and Cheese Experiment has been conducted. In an effort to prove that “real food” often doesn’t take more time or more energy to prepare than “processed food”, I made both Annie’s Mac and Cheese, and my homemade Creamy Mac and Cheese – timing myself from start to finish on each – not doing any of the steps ahead of time. I began last week by making three boxes of Annie’s Mac and Cheese. I do purchase this sometimes for the very occasional treat. I appreciate that Annie’s brand is at least made with better ingredients. But did it save me time to make this boxed, convenience food? From start to finish, making a big pot of three boxes of Annie’s Mac and Cheese took me 18.5 minutes. Not bad, plus I was able to wash a few dishes while the noodles were boiling. And how long did my homemade Creamy Mac and Cheese take??? I do have to watch the pot and stir more often while I’m making homemade mac and cheese, compared to the boxed variety. However, I have found that I don’t have to stir the pot constantly, and can stir, then do another little job, then stir again, and do something else. As long as I keep going back to it, I am able to get several other little jobs accomplished while I make this dish. This time, I was going back and forth between boys and May Day projects, keeping up without any troubles with stirring the mac and cheese. And the taste? There is no comparison. Boxed mac and cheese is kinda fun, but I ultimately find it to be empty and flavorless. I also have a hard time getting past the unnatural color. Cheese isn’t orange, people! I love that the homemade mac and cheese has more sustenance and more natural flavor. Bring on the nutrients! While I was having this mac and cheese throw down, I decided to be nerdy and calculate the price difference. 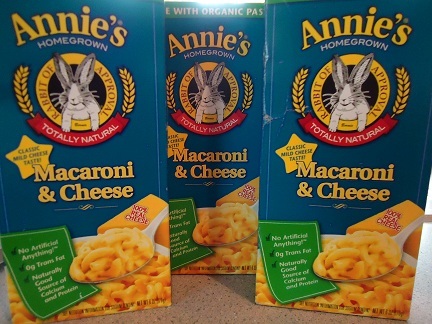 It costs around $3.85 to fill my family with Annie’s Mac and Cheese, because yes, it does take all three boxes to fill us. 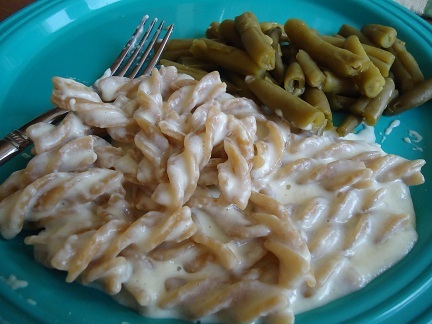 It costs about $4.50 to make a pot of Creamy Mac and Cheese, since I’m using organic, raw white cheddar. That breaks down to be $0.11 extra cents per person to feed my family this healthy, easy meal. I’m pretty sure I can afford that. So there you have it. Am I completely knocking boxed mac and cheese? Nope. Just stating the facts based on my research and experiment conclusion. Might we still eat the occasional boxes of mac and cheese? Maybe, and we’ll probably even enjoy it a little bit. But do I ever get to say that making a box of mac and cheese saves me time and money compared to making homemade mac and cheese? I’m thinking that it might be fun to do other experiments like this one. Any suggestions or ideas for what I should test next? I get it. I understand. There is a lot going on in life. People are super busy, running from here to there. Many of us are raising children, working full time jobs, and spending a good deal of time going to and from various activities. Cooking and creating healthy meals can take significantly longer than throwing a frozen pizza into the oven or making some ramen noodles. All of this is true. I really, really, really believe that we can all eat a healthy diet, no matter what our situation in life may be. No excuses. I didn’t say that we all have to eat a perfect diet. I’m not even sure how that would actually look. But how about we all do the best we can with what we have so that we can be as healthy as possible? Yes? Give yourself a break from the guilt of not feeding your family perfectly. But don’t let the “I’m busy and don’t have time” excuse pull you away from making healthier choices. Most days, I feel like I wrote the book on “busy”. But I’ve decided to make healthy eating happen anyway because it is important to me. 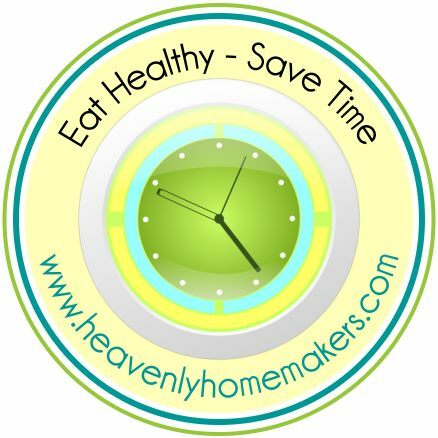 Overall, I have found that healthy eating doesn’t take much more time than eating junk food. It doesn’t take any extra time out to make the choice to use real butter instead of margarine. Or how about the time it takes to grab an apple instead of a cookie? 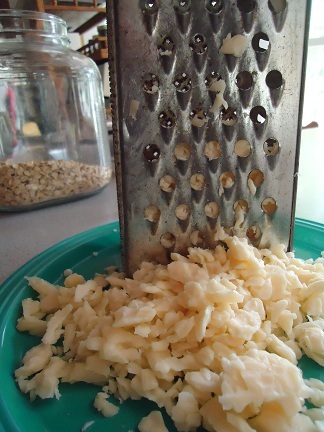 Buying real cheese instead of processed cheese? Eating a salad instead of french fries? Putting a roast and veggies into the crock pot in the morning instead of waiting in line at a fast food drive through at night? What are some simple ways you have found to improve your diet that have not taken much (if any) extra time?! What have you found to be the biggest challenges in regard to taking the time for healthy eating? Guess what? I’ve got loads of healthy eating, time saving ideas to share with you. Watch for this new feature in upcoming posts! I live in a small town in rural Nebraska. I am surrounded by smaller towns, and tiny towns, and lots and lots of big, huge corn fields. We can drive to Lincoln to a Trader Joes in one hour, or to Omaha to a Whole Foods store in two hours. Neither of those options is convenient since we don’t make trips to Lincoln or Omaha very often. Therefore, I just assumed that eating healthy foods would be out of the question for our family. Where was I supposed to buy high quality food without having to drive 100 miles to go shopping? And then, would I even be able to afford the food at those specialty stores? We order from a health food co-op. Azure Standard has been wonderful for us. We order online once a month, then pick up our food when it is delivered right here in town. Their prices are unbelievably good. I encourage you to look into joining a health food co-op as a way to find whole foods at a reasonable price. If Azure Standard doesn’t deliver to your area, look through all the comments on this post to learn of a health food co-op option that might be available where you live. Here’s a sample of what our food co-op order looks like. are our favorite go-to online resources. We watch for sales and free shipping deals, and have learned the best way to get good prices while shopping online. Here is a detailed list of what food we purchase from each of these online resources. We buy food from local farmers. We are blessed to have friends and farmers around us who raise animals in a way we appreciate (grass fed, free range, no hormones or antibiotics, etc). Our eggs, milk, beef, lamb, and chicken all come from sources close-by. North Star Neighbors is located a bit far away compared to our milk and eggs sources, but our town happens to be right on their delivery route. Yep, for a small delivery fee, North Star Neighbors delivers meat right to our doorstep. We pick up our milk and eggs once a week from friends. In addition, we take advantage of our farmer’s market each summer and fall. If you’re looking for local healthy food options, I encourage you to check out LocalHarvest.org to see what resources are available where you live. Also, start asking around to others who you find are interested in healthy eating to see what their food sources are. You might get a few crazy stares from people, but hey, you might also find out who sells raw milk or grass fed beef in your area! We grow food in our own garden. Our garden provides us with green beans, tomatoes (for sauce and soup), peppers, potatoes, corn, and a variety of other yummy foods that are simple to preserve. Also, if we don’t have space to grow something, but others around us do, we aren’t afraid to make a trade or work out some sort of deal in exchange for picking some produce in their garden or on their fruit trees. Again, it never hurts to ask! Often, we get garden/tree produce for free when people have an abundance. Then, we get to work, canning, freezing and dehydrating all the produce. 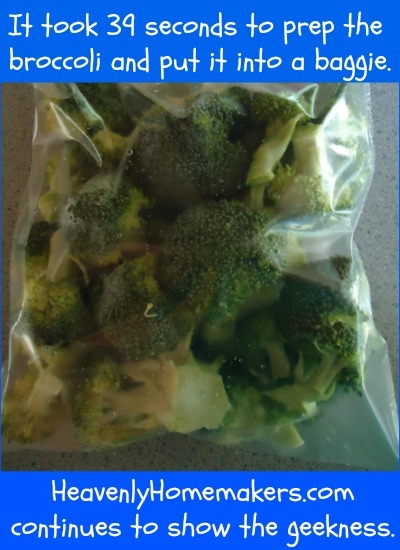 Here are all of my posts detailing what and how we preserve foods. We work with our local grocery stores to special order food. Have I mentioned that it never hurts to ask? In the past, we’ve talked to our local grocer about special ordering cases of food for us, and they’ve been happy to accomodate. They have even given us a good deal on these purchases since they know that since we’re buying the entire case, none of that food will spoil on the shelves. As always, remember that we are all different, our food sources are all different, and we all have different family sizes and budget amounts. We’re all on the same team here, just looking for ways to encourage one another on our healthy eating journeys. What are the best healthy food options where you live? Have you found ways to think outside the box when it comes to whole food purchases? What Does “Eating Healthy” Even Mean?! 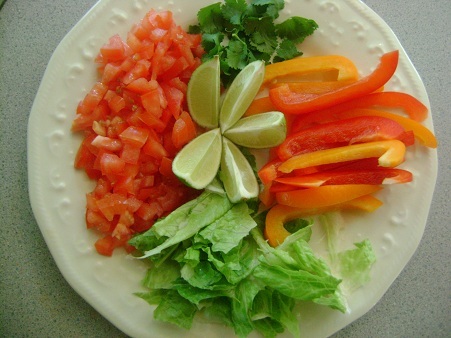 Most of us desire to eat a healthy diet. But how do we define what “healthy” eating is? Well, according to all the information I’ve read over the course of my adult life, it would appear to me that, in order to be healthy, we should all be eating a low fat, no fat, high fat, low carb, high carb, vegan, low cholesterol, whole grain, no grain, soaked grain, low calorie, sugar free, soy free, pork free, dairy free, gluten free, and whatever you do – don’t ever eat real butter…diet. I’m not sure about you, but since this pretty much eliminates everything but asparagus, I’m left feeling a little bit hungry. Why does there have to be so much conflicting information out there, and why is there generally significant research to back up each claim? I’ve even seen studies done to show that high fructose corn syrup is actually good for you. Are you kidding me?! About the only consistent information I’ve seen in most dietary recommendations is the advice to eat lots of vegetables and to drink plenty of water. Yay, something we can all agree on. But where does that leave us in regard to everything else we should be eating? I think there is much that we each need to figure out for ourselves, but I will tell you where I have landed on defining what I feel is truly healthy. Am I the authority on the subject? Good grief, no. I have done years of research and feel much peace about the foods I feed my family. But I’m just the mom next door who is having a bad hair day. As with everything, don’t just take my word for it. Check into it for yourself. Pray about it. Ask God to show you what is best for your family. So how do I define what food is “healthy”? I believe that real, whole food is healthy. By real, whole food, I’m talking about real butter, full fat milk and cream, grains in their whole form, real fruits and vegetables, real meat, real cheese, real oils, real salt. Fruit snacks are not real food, nor are they really fruit. 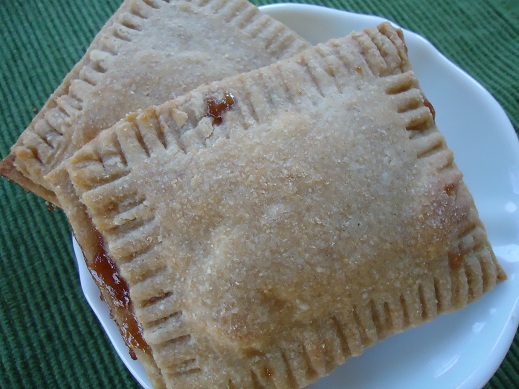 Strawberry filling in a poptart is not real. Margarine is not real food. And on and on it goes when we look at the many processed foods that fill our grocery stores. If I can’t recognize the ingredients in a product, it is possible that while it is perhaps edible, it should not really be considered a “food”. I trust food that has been around forever. Stuff like Cheese Whiz? It was invented in 1953 by a food scientist. Oh, and for the record – when I was looking up the ingredients in Cheese Whiz, I actually found an article proving its health benefits! See? Told you there was “research” to back up just about any claim! I believe that it is important to maintain a balanced approach in our diet. I believe we can over-think it and make healthy eating too complicated. Free range, organic, grass fed, soaked, fermented – what is best? What about eating low fat, low carb, or trying all varieties of diets in order to lose weight or to be healthy? I just want to eat real food. I just want to focus on the basics. Nothing complicated. Nothing gourmet. Just real, whole foods that please my family and offer nourishment. I breathe a sigh of relief when I remember that all I really need to do is make my family’s favorite foods with the healthiest ingredients that I can get my hands on and my budget to work around. God knows my heart and my desire to care for my family in the best way that I can. I feel peace when I let go of the complicated questions I have about healthy eating, and instead simply let God be the true care-taker of my family. How do you define “healthy eating”? I’d love to hear. 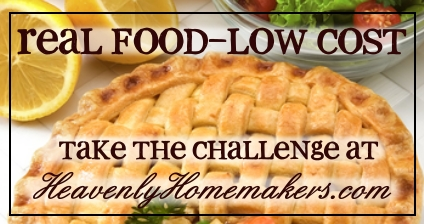 Join the Real Food – Low Cost Challenge! I’ve decided to do things just a little bit differently during the next few days, just for kicks. :) Since most of last week’s posts were discussing the expense of eating healthy, whole foods – let’s do a little experimenting, putting some healthy recipes to the test. An “expense test”. Instead of planning a full menu for this week, I have instead made a list of a few of our family’s favorite recipes – recipes that you’ll find regularly on our weekly menu plans. Throughout the next several days, I will be making each of these recipes. Then, I’ll pull out the calculator and do a price break-down to determine just how much it costs to make these healthy foods. I will post frequent updates, sharing the results I’ve found. I’m excited to see which of my recipes might be most costly to make, and which ones might be less expensive. This is not something I’ve ever done before, so I’m pretty excited about this experiment! I’d love for you to also take some of your family’s favorite healthy, real food recipes and do a little cost break-down on them. You might just be surprised at what you discover! Keep on the look-out, because throughout this challenge, I have a few fun surprises in store as we put these recipes to the test. Then mark your calendar, because on Thursday, February 9, we’ll all come together with a special Real Food – Low Cost Link-Up, so that you can also share with us some of your family’s favorite real food, low cost recipes. Be watching for lots of fun updates detailing what I’ve discovered about the specific costs of our food. You can, at any time during those posts, share some of your discoveries too. Sound like fun? Let the challenge begin! Be sure to read Is It Expensive to Eat Healthy Food, Part One and Is It Expensive to Eat Healthy Food, Part Two if you missed them! The choices our family has made, in our effort to eat as healthy as possible, have definitely caused an increase in our grocery budget – not to mention the fact that our boys are now eating a lot more food than they used to eat. I don’t feel like our eating habits can necessarily be called “expensive” to maintain, because we are making what we feel is a wise investment in our health. But yes, it does cost more to eat healthy, whole foods than it costs to eat lower quality foods. I do what I can to keep our expenses as low as possible. Some of the following ideas may work for you. Some of them may not. I’ll just share the tricks I’ve tried that have worked for us with the hope that you’ll find some new ideas that may work for you too! 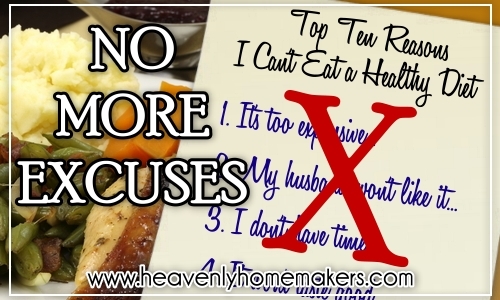 I will likely go into more detail on each of these as we continue on with our No More Excuses series. So hang with me! 1. We eat basic, simple meals. 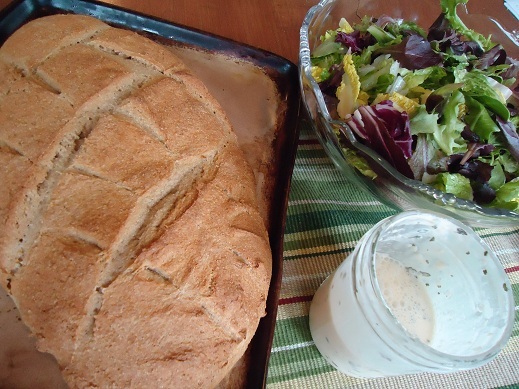 Scroll through all of the Bread and Breakfast, Main Dishes, Side Dishes, and Condiments recipe ideas listed all over my site. None of those recipes are expensive to prepare. Or, if it is a little pricier, I balance it with a meal that is super inexpensive. Remember how I sometimes stretch a chicken to last give us six meals? 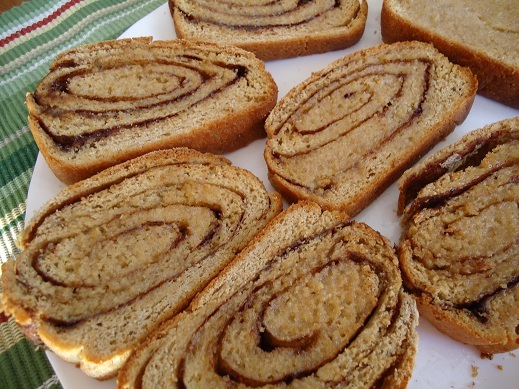 Whole Grain Cinnamon Swirl Bread – just over $1.00/loaf! 2. I cook from scratch if at all possible. As far as I could figure, it costs me just over $1.00 to bake one loaf of Honey Whole Wheat Bread, which is 100% Whole Grain, no corn syrup, organic ingredient filled, top knotch bread. I’m sure if I broke down other recipes I would find that making food from scratch saves us all kinds of money. Every once in a while I splurge on store-bought packaged food, because my sanity appreciates the sacrifice. But overall, I try to make as much as I can so that I keep our expenses much lower. 3. We rarely eat out. Eating out as a family is not an option that we ever fall back on, except for the very occasional splurge while traveling or rare special occasion or treat. This saves us so much money, making it possible for us to put our hard earned dollars toward healthy ingredients for eating well at home. For more information and inspiration, read this post titled: Eating Out Less. 4. We try to think outside the box. We have researched, asked around, and figured out that there are many ways to save money on healthy groceries by shopping online, through health food co-ops, through local farmers and just by asking the right questions. Many people now call us and offer us their leftover fruit from trees and bushes because they know we’ll love it. Bartering and trading have been a wonderful way to gain access to healthy food for free or cheap. And remember how I shared that talking to a local grocer proved to be a great way to get organic produce for a much lower price? Try this idea – it never hurts to ask! 5. We found a food co-op that provides great prices on great foods. Our healthy food co-op, Azure Standard, saves us loads of money on healthy foods. Check out the following post to help you find local co-ops that might be of service for you where you live: What Health Food Co-op Is Near You? In addition to those ideas, we buy food in bulk, stock up when food is in season or on sale, can and preserve foods from our own garden, grind our own flour, and otherwise work as hard as we can to find ways to feed our family for as little as possible. Look over Our Whole Foods Pantry, Freezers, and Refrigerators Resources page to see a huge list detailing where we find most of our food. As you work to eat a healthy diet and keep your expenses low, always remember that God is in control, and he knows your heart! Coming up next in the No More Excuses series: With All the Conflicting Information Out There, What Does “Healthy” Even Mean?! I know you are also working as hard as you can and doing the best you can to keep your expenses low. Share what works best for you as you work to stay within your grocery budget. I love that we can all learn from each other! 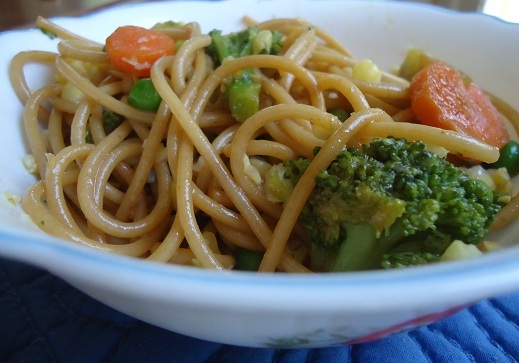 Be sure to read Is It Expensive to Eat Healthy Food, Part One if you missed it! If you’re looking to replace every single not so good ingredient in your kitchen with all of the best, healthiest, organic, free range, grass fed, yada yada ingredients, all at the same time – yep, you’re looking at a hefty price tag right from the get-go. Why not take a step back, make a list of changes you’d like to make, then prioritize them and start making small changes – one at a time? What changes can you make that will help you feel better about feeding your family, but that might not hit so hard on the pocket book? Read through this Simple Steps to Healthy Eating Series for some ideas to get you started. But don’t feel like you need to take all the steps at once. Any small step you take puts you on the road toward healthier eating. Some of those steps might just not cost much at all. And some might actually save you money. How ’bout that? What works for our family may not work for your family. My food resources are likely to be much different from your food resources. The cost of food where I live may be much different from the cost where you live. I’ve heard of free range eggs costing people all the way from $1.00 per dozen to $8.00 per dozen. I’ve gotta say, if free range eggs cost me $8.00 per dozen, I’m pretty sure we’d eat very few eggs and I’d simply buy the regular, cheap ones from the store to use when I bake. Thankfully, I’m blessed to get free range eggs for just $2.50/dozen – a great price if you ask me! Each family has a different amount to spend on groceries each month. Every family has different dietary needs. Every family has different circumstances. There is no “perfect dollar amount” standard for how much any of us should be spending on healthy food. I shared more on this subject in this post: “No Grocery Budget Comparing Allowed”. No matter what you buy, how much you spend, what you eat, or how you eat it – your choices can honor the One who provides for our every need. If you aren’t blessed to find free range chicken that doesn’t cost the same as your mortgage, you will still honor God and your family by eating a regular ol’ chicken. At the risk of sounding goofy and sacrilegious – God can bless your chicken whether it’s free range or not. God wants us to be wise stewards of our resources and to simply do the best we can with what we have. He knows our individual circumstances and He knows our heart. He understands our desire to do what is right for our family and He will provide what we need to do just that. Don’t leave God out of the picture and think that you must be the one doing a perfect job selecting, purchasing, and preparing food. God’s gotcha covered. Do not be so focused on trying to make healthy food choices that you lose sight of the One who matters most. No matter where you are on your healthy eating journey – no matter where you land on specific dietary choices for yourself and for your family, God can and will be glorified. What would you consider your biggest struggle in regard to the expense of eating a healthy diet? As we dive into our No More Excuses series, I decided to first tackle the excuse that it is “expensive to eat healthy food”. This one seems to be the most popular complaint among those of us who are working to eat and feed our families a healthy diet. I ended up with so much to say on this topic, I divided the material into three separate posts that I will be sharing throughout the week. To begin part one of these posts regarding the thought that “healthy food is too expensive”, let me just start out by saying, “I hear ya!”. That was my biggest complaint too, my loudest excuse, and one of the main reasons I didn’t think eating a healthy diet was possible for our family. After all, I’m the girl who used to get everything for free or cheap with coupons. The thought of actually spending money on food was painful to me when we started our healthy eating journey. I had no idea where the extra money for healthy food would come from in our already very tight budget. After lots and lots of research, experimentation, and tweaking of our budget, we finally figured out how to make this work for our family. Ultimately, I had to surrender and let go of the idea that spending money on food was bad, and instead embrace the truth that spending money on good, nourishing food is a wise investment for our family. But still, it is a fact that coconut oil and olive oil cost more than canola oil and crisco. Real butter costs more than margarine. Whole wheat pasta and real cheese costs more than a box of mac and cheese. So, does that mean that healthy eating is indeed expensive? I think it’s a matter of perspective. Our grocery budget has definitely gone up since we began our healthy eating journey. The way I cook now is completely different than the way I cooked when I bought processed and unhealthy foods with coupons, but does that mean that our healthy food should be considered expensive? Pardon my geekiness spewing forth, but just as I did a few years ago, I did a new break down of what it costs to feed my family on an average day. I think it’s very interesting to take a nitty-gritty look at what it costs us to feed one person per day, and to analyze that number to see if in fact I could or should cut back our budget in any way. We currently spend about $600/month on food. Because there are six in our family, this means that we spend about $100/person/month. This divides into an average of $3.33/day/person, which means that it costs about $1.11 per person per meal. I don’t think $1.11/meal/person is very expensive, but that’s just my opinion, and as I said earlier, it is a matter of perspective. Then, I’ll wrap up the week by sharing some practical ways to eat a healthy, whole foods diet while keeping your costs low. For today, I’d love to hear a little about your grocery budget break-down. Join my geekiness and do the math. If you care to share, how much do you estimate that it costs to feed one person in your household for each meal? I’d encourage you to read this post: Do You Need to Cut the Grocery Budget? I’d also like to encourage you to check out Once a Month Mom’s Get Real 2012!